MediRabbit.com is funded solely by the generosity of donors. Every donation, no matter what the size, is appreciated and will aid in the continuing research of medical care and health of rabbits. • Ixotid ticks are protected by a hard shield and their mouthpieces can clearly be seen. They include commonly found ticks all over the world, like Ixodes sp., Amblyomma sp., Boophilus sp., Rhipicephalus sp., and Haemophysalis sp. All can affect rabbits. 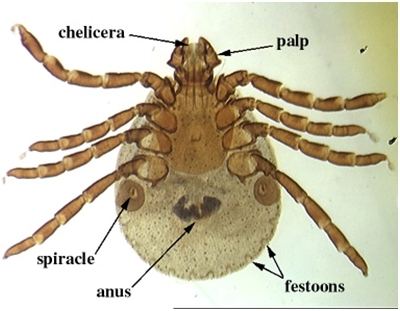 • Argasid ticks are soft ticks whose mouthparts and “false head” (capitulum) cannot be seen when viewed from the dorsal side. They live essentially in arid regions on the American continent, Africa and India. Members of the Otobius sp., and Ornithodoros sp. can plague rabbits. Ticks are small (less than 5 mm in length) and have a reddish or brownish color. Their life cycle is complex. 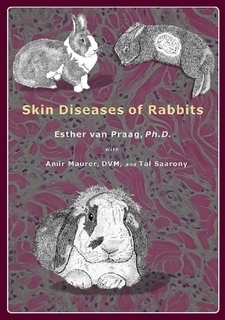 Wild rabbits, cottontails and hares are commonly plagued by Haemophysalys leporis palustris. This tick has typically three developmental phases, which occur on three different hosts. After feeding blood or serum from its host, the tick larva will fall to the ground, in order to molt. The next stage larva or nymph will find a new host to feed on. Once adult, the tick will hide in the vegetation. When it detects the presence of a host thanks to organs sensing its release of CO2 release and body temperature, it will crawl onto its fur and start engorging with blood. During the feeding, the tick will release saliva and enzymes into its host, to keep the bite open. During this phase, tick-borne diseases can be transmitted. Soft ticks also affect lagomorphs. The commonly found one is the red tick Otobius lagophilus. All the larval and nymphal intermediates are found on rabbits, where they feed on lymph secretions. 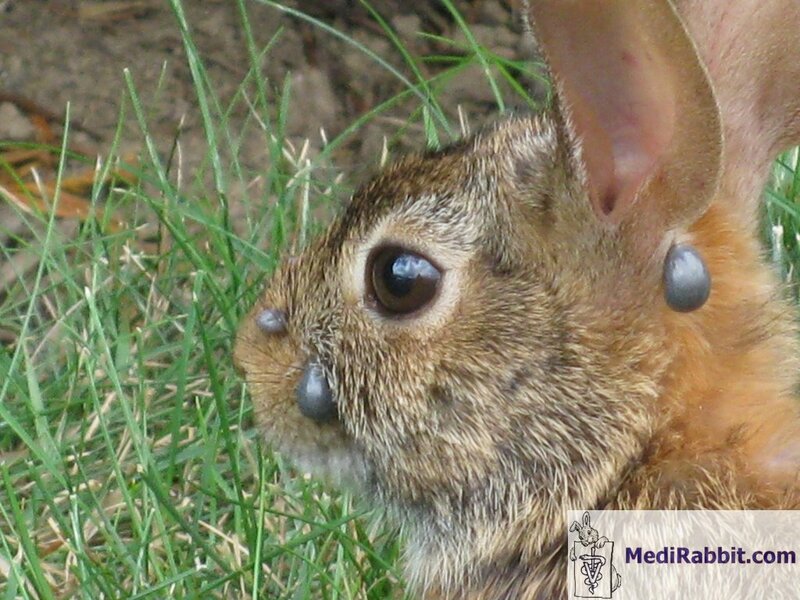 Soft ticks can be vector for various diseases affecting rabbits. Non-engorged tick found crawling on the fur of the hind limb of a rabbit. Ticks are usually found while inspecting the fur of a rabbit. Preferred locations are the ears, the area between the ears, the neck and the dewlap of female rabbits. Severe infestation can lead to macrocytic (enlarged red blood cells) normochromic (referring to a red blood cell of normal color, usually because it contains the right amount of hemoglobin) anemia. Cottontail infested with replete (fully engorged with blood) ticks. Once feeding on blood is finished, the tick will detach itself from its host and fall to the ground. As many ticks as possible should be carefully removed with forceps and killed rapidly by immersion in an acaricide solution, alcohol, or chloroform solution. This avoids eventual contamination or spreading diseases carried by the tick host. 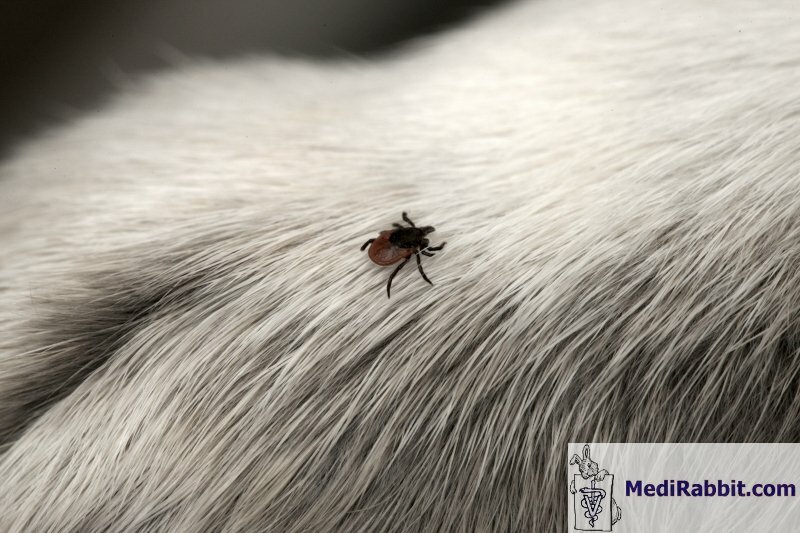 If the presence of further ticks is noticed, or if the infestation is severe, administration of ivermectin (0.400 mg/kg, SC, once) is will successfully get rid of the ticks. Although successfully killing ticks, the use of insecticide products containing pyrethrin, permethrin, amitraz must be avoided, due to their secondary toxic effects in rabbits. Fipronil is forbidden for use in rabbits. Severe tick infestation can lead to anemia and death. When observed in a rabbit, blood transfusion from a healthy rabbit can be attempted. Thanks are due to David Fulmer for the permission to use the picture of an infested cottontail. McGowan MJ. Relationship between skin-sensitizing antibody production in the snowshoe hare, Lepus americanus, and infestations by the rabbit tick, Haemaphysalis leporispalustris (Acari: Ixodidae). J Parasitol. 1985; 71(4):513-5.